This is our favorite way to preserve dried shell beans, and we're not alone...it is the most popular recipe on this blog! 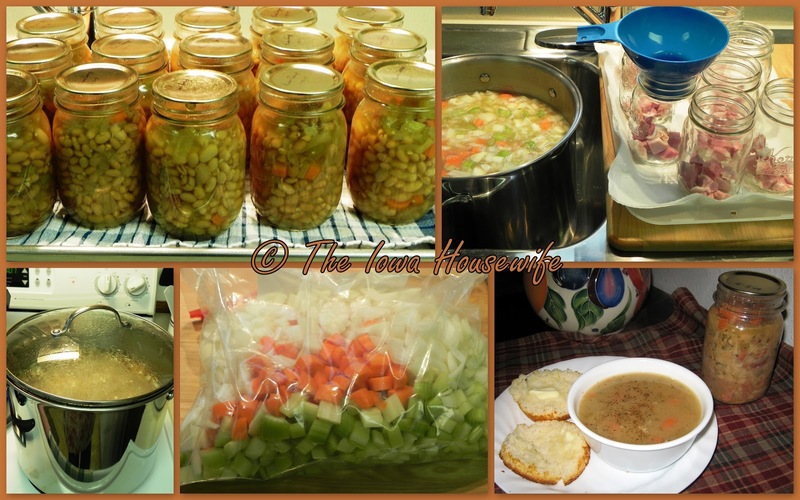 I’ve been canning this recipe from the "Better Homes and Gardens Home Canning Cookbook" since 1973. The optional ingredients are not in the original recipe; in 38 years, any recipe is bound to get modified a little. If you use the optional ingredients, it makes 6 pints, if not, it makes 4 pints. I usually make 3 times this recipe and can it in 2 canners - that's usually enough for a year's supply for us and we can share some. That’s how much we like bean soup. I do can it in pints; when we have drop-in company, I just use more jars. This old recipe makes delicious soup of just the right consistency; no "bean bricks" or mushy soup. 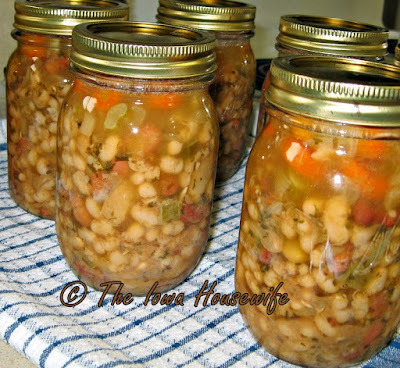 The biggest advantage to canning bean soup, besides the obvious one of having it ready in 10 minutes, is that we don’t have to eat bean soup for days. I can serve it whenever we want and it tastes like the best homemade soup with no fuss and no leftovers. That gives me plenty of time to make corn bread to go with (our favorite). I often can this in the “off-season”; after the garden canning is completed or perhaps after the New Year. We like ham shank; I have to ask for this at our grocery meat counter; they keep it in the back. If you use ham, you may want a ½ teaspoon of salt per pint. I usually chop my vegetables the day before to reduce the stress on canning day. Cover with water or chicken broth; add shank, peppercorns and bay leaves (in a spice bag or tea ball), parsley and garlic. Simmer; covered, 1 hour, adding carrots, celery and onions last 15 minutes. Remove spice bag and ham bone, cut off meat and dice in 1" pieces. Wash jars; keep warm until filling. Prepare lids according to manufacturers instructions. Divide ham among jars. Using a slotted spoon, ladle hot solids into hot jars, about 3/4 full. Fill with liquid, leaving 1" headspace. Use hot water to fill if necessary. Remove bubbles with plastic knife and wipe jar rim carefully before sealing. Cover and seal, place in pressure canner (with 3 quarts simmering water), exhaust steam 10 minutes, process in pints 1 hour and 15 minutes at 10# pressure (for up to 1000’ elevation), quarts for 1 1/2 hours. Let pressure drop of own accord ( about 30 minutes), open canner, remove jars to clean towel and let cool and seal, setting apart to allow air to circulate. Remove rings and wash jars carefully. Yield: 6 pints if using carrots and celery, 4 pints without. Equipment: Stock pot or Dutch oven, chopping board, pressure canner, 13 x 9" pan with paper towel for jar filling, jars, lids and rings, funnel, lid magnet, jar lifter, plastic knife, small saucepan for lids, 4 quart measure for water, clean towels, stock pot to keep jars warm if necessary. TO SERVE: Add water to the top of the jar, pour into a saucepan and heat 10 minutes. 1 pint makes 2 cups of soup. 2015 cost: 56¢ per jar with carrots and celery. Sale bulk beans – 4# for $2.39 and sale ham $1.68 per pound. Oh if only I could do this without messing things up! Well, Donna, looking at your blog you appear to be an accomplished cook. Canning is just one more step than cooking! 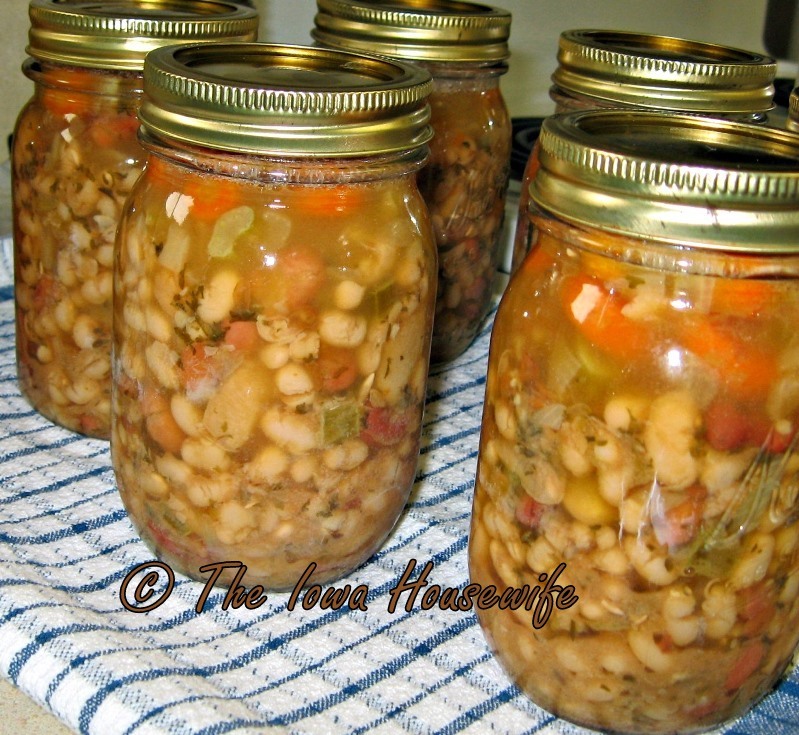 If you aren't already canning, start with something simple like canning plain beans, then try this recipe with cut up ham instead of ham shank; it's easier. Get out your canning things ahead of time and cut up and refrigerate your ham and vegetables the day before; that makes for less confusion on canning day. If I can do it, you can too. I started from scratch too! Thank you for the recipe! I just finished processing I don't know how much celery for the freezer. Just lots, you tend to lose count after what seems like the zillionth stalk. I'm going to can a canner load of this soup tomorrow, using some of the celery from today. Thanks again, it looks delicious. GOod luck! We know you'll like this recipe. We had some for lunch yesterday...so convenient. Thanks for the recipe, I have a load in the canner right now! I did add the cup measurements to the recipe above...they are approximate, of course, depending on how finely they are sliced or chopped, etc. A kitchen scale is a good kitchen investment...they are readily available, even at Walmart. Glad you're trying this recipe, it's one I always keep on hand. Thanks sue. Theyre out of the canner. Thanks again for nice recipe and changes.